Not keen or motivated enough to work out alone? Try one of the group workouts on offer; a personal favourite being Nike Run Club. From ‘Morning miles’ runs to break the routine, ‘Ready, Set, Go’ runs to run your first kilometre, and ‘H.I.T & Run’ sessions which combine training and circuits, to ‘Home run’, running in a group, and ‘Speed Run’, designed to increase your rhythm, there is a running and training plan to suit all levels. Once you’ve reserved your place online, all you have to do is show up at the meet point (outside the W hotel) and have fun experiencing personalised training from star athletes for free! A fact hard to go unnoticed – the Spanish do love the vast amount of different ways that they seem to get around the city… You’ll see people of all ages travelling around on wheels; from skateboards, longboards and rollerblades, to scooters and Segways, there’s something for everyone. 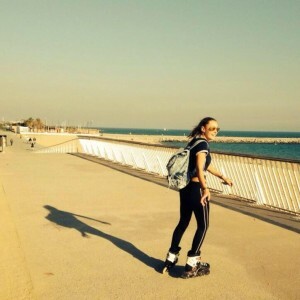 A fun and entertaining way to spend a day out whilst getting fit, rollerblading will leave you feeling energised and rejuvenated after all the exercise and the fresh ocean air. And if you don’t have your own pair, they can be rented at various locations throughout the city, especially along Barceloneta beach. Another group workout plan, Urban Gorillas offers personalised training, swimming sessions, group circuit training and group Gorilla runs throughout the city. Priding themselves on being a top-level fitness and boot camp group, they strive to offer a healthier lifestyle alongside outdoor training in an urban environment. By taking part in their activities you can discover new and cool places in the city and meet new like-minded people whilst training outdoor with friends. The group circuit training is the perfect way to increase overall fitness as it focuses on cardio, high intensity, agility, core development and inner strength, whilst the Gorilla run uses all kinds of urban objects to perform a variety of fitness exercises. On the website you can find the different memberships on offer, as well as their free trial. Urban gorilla offers a diverse and fun-filled way to work out in the open air and along the beach, so grab your trainers and head on down! Take advantage of the year-round sun, and long hot summer days by heading down to the beach and playing on one of the several volleyball pitches they have set up. 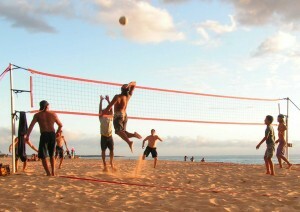 Just grab a group of friends and ball; it’s simple, free and a fantastic sociable way to spice up a lazy beach day. There are several open-air workout gyms dotted across the city, offering free fitness equipment to all. However, the most scenic and renowned one is located right in the centre of Barceloneta beach, providing a panoramic view of the glistening Mediterranean and sandy shores. At every hour of the day you can find locals working out here in the gleaming sunshine using the various apparatuses on offer. The gym is fully equipped, combining street workouts, calisthenics, parkour, freeletics, boot camp workouts and bodyweight training – there is certainly something for everyone. Take advantage of the Spanish sunshine and head on down for a breathtakingly picturesque beach workout at any fitness level. Whilst visiting a coastal city you are bound to stumble upon enthusiastic surfers, keen to explore the waters surrounding the metropolitan coastline. Surfing is a fun and unique way to get fit whilst enjoying fantastic views from the ocean itself. The benefits of surfing are numerous, from increasing cardiovascular fitness and muscle strength, to providing you with a great way to spend time outdoors, enjoying the natural environment and relieving any stress or tension. If you are already a surfer then get stuck in, but if you are a beginner or in need of lessons, there are several surf schools dotted along Barceloneta beach, including Puka Surf and Escola Catalan de surf. Try something new today and give it a go! Cycling is one of the easiest way to fit exercise into your daily routine because it is also a form of transport. It’s low impact, but still helps you lose weight, reduce stress and improve your overall fitness. 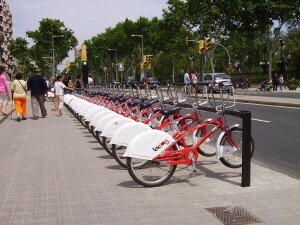 Barcelona is a top cycling city, with the road layout designed to include various cycle routes. If you don’t own a bike there are bike rental shops located all throughout the city. Cycling along the beach and dreamy coastline is a fun and invigorating way to pass the day, looping from the W Hotel at one end of Barceloneta beach, all the way down to the end of Platja de la Mar Bella at the other end. The benefits of practicing yoga are never-ending; ranging from increased flexibility, muscle strength and toning, to improved respiration, vitality, energy, and weight reduction, cardio health and enhanced athletic performance. Yoga is an up and coming activity among the Spanish, with yoga centres and group classes popping up frequently around the city. With numerous classes to chose from, what a better way to practice yoga than on the beach front itself. There is no better way to start your morning than a class on the beach, with the tantalising ocean sparkling right ahead of you. Happy Soul Yoga has a range of different beach-side classes to chose from, as well as the fantastic Australian-born yoga teacher, Stacey, offering stunningly beautiful Hatha/ Vinyasa sea-side yoga classes on Wednesdays and Sundays. To find out more about Stacey’s yoga classes, follow her inspirational Instagram account here. As well as these tried and tested recommendations, have a look on Meet up , the wonderful website that helps people in different cities meet up, based on their passions and interests. Simply go on the Barcelona page, and search whatever hobby you are interested in, for example ‘running club’, ‘outdoor yoga’, ‘beach fitness’… the list is endless. Due to the diverse and dynamic nature of this wonderful city, the range of group activities on Meet up is unending.